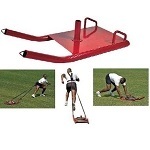 Product: Exercise Equipment VersaDiscPro Versa Disc Pro. 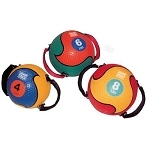 Air filled cushions - Workout difficulty can be adjusted with level of air pumped in. Incorporate with workouts for enhanced balance training. Build core strength by using one or two cushions for push-ups, lunges or squats. Enhance balance techniques by doing sitting, standing and lying exercises. Made of soft pliable PVC. VersaDiscPro has two textured surfaces that are useful in rehabilitation and massage therapy. Instructions included. More Stability Challenges! This 18" diameter disc offers the same great benefits as the VersaDisc but it is wide enough for you to stand on with both feet. Plus, it provides more instability and difficulty for intermediate/advanced balance training. Each side offers a different level of challenge. Stability Training on Two Ledges. Color: Blue. Extreme balance challenge for the advanced user or fitness professional. 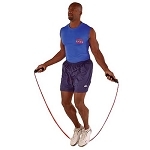 Core strength and joint stability is intensified by the added instability and difficulty. Color: Blue. Dimensions: 18" Diameter, 3 1/2 " High. Wt. 3 lbs. Exercises include stability training on two legs, body weight squats, lunges, push-ups, and abdominal training. Competitive Edge Products, Inc. is an authorized reseller for Power Systems VersaDiscPro Versa Disc Pro Exercise Equipment. A+! Quick ship, responsive to inquiries, item A+! TU!! I received my Disc and love it. Dimensions: 14" x 14" x 3"